In June of 2015, WWNO in New Orleans launched a podcast called Katrina: The Debris. They called it a “pop-up podcast.” It was time-bound; ultimately, a thirteen-episode experiment. The occasion was the tenth anniversary of Hurricane Katrina. As national news outlets flooded into New Orleans months before the anniversary, WWNO wanted to own the big story in its midst. The Debris was an experiment — a successful one! — by a small station with minimal resources. The NPR Training team wanted to offer other stations the chance to learn from WWNO’s successes and challenges. 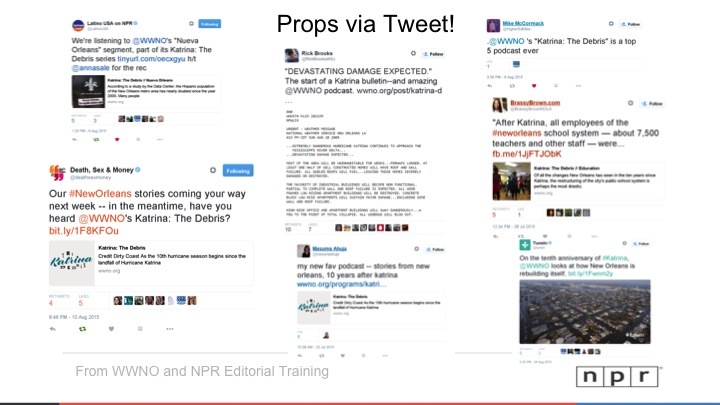 On November, 17, 2015, more than a hundred people from around the public radio system tuned into our webinar. WWNO’s News Director, Eve Troeh, and the station’s Digital Director, Jason Saul, spoke about the process of conceiving, producing, managing and disseminating the podcast. Below, you’ll find a video of the webinar and some of the slides and takeaways. *Apologies for the slightly-echoey audio. The technical gods, sadly, did not smile down upon us on that day. The Debris was a numerical success for WWNO. The numbers below suggest better-than-average engagement with both the podcast at the web content, as well as impressive audience engagement on the NPR One app when the podcast was offered to listeners (a promo by Eve gave them a chance to opt-in and listen). You’ll also see the themes WWNO chose for its episodes, as well as some of Eve and Jason’s takeaways. WWNO reached out widely within the public radio world and beyond to let people know about the podcast. As Jason says in the webinar, they made it “as available as possible to as many people as possible.” They also connected with listeners via PRX and NPR One. And, as you can see in the slide below, they inspired a lot of people to get the word out. A $15,000 grant for Katrina coverage helped WWNO pay for a 29-hour-per-week temporary producer, a handful of freelance stories, and tape syncs. The team got more bang for its buck by planning stories for the podcast that could be easily slotted into WWNO’s Morning Edition and a local weekly news show. NPR Digital Services explain how here. Check out WWNO’s podcast for yourself right here. Thanks to Eve and Jason for all their work in developing this webinar, and congratulations to the staff at WWNO for taking some risks and creating a great podcast.